The whole of last week, we shared our favorite travel quotes, and this week, we talk about one of our favourite aspects about travel – FOOD! I will as they say, eat my way across the globe! So sit back and enjoy our bite sized anecdotes on all things yummy! Our all time favourite haunt is the Girgaum Chowpatti, simply because it’s so close to home, and MARINE DRIVE! You can’t not be excited about marine drive, the sky line, the sea and butter channa.. So Chowpatti is this sham of a beach, and I say sham because it really is a mess, which looks like the adopted child of the kumbh mela on a Sunday. In the food section, we headed to the guy we usually go to, because he has the spiciest stuff to offer. 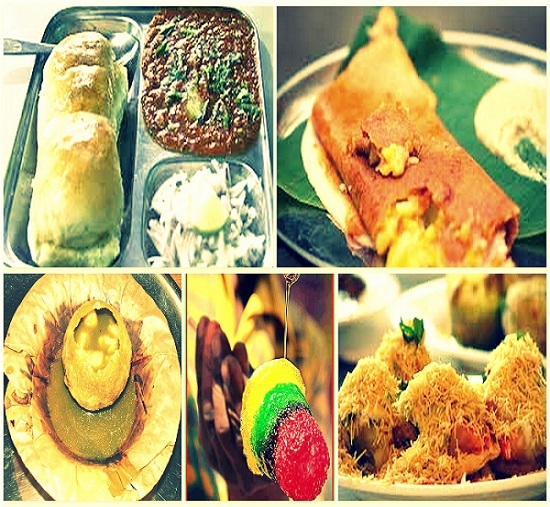 With our usual slew of orders pani puri, paav bhaaji, dosa, and a sev puri, our taste buds tickled in anticipation. One by one we gobbled down each dish as it was presented before us, though I did make the mistake of ordering the Schezwan Dosa, which was so bad I lost all taste in my mouth. It’s usually pretty good, so there was a lot of disappointment. But there isn’t a food mishap that a blueberry gola can’t fix! Nobody told me this while I ate, that it’s not a good idea to mix two cuisines, or severely hot and cold food in a single meal and in quick succession. 😮 Which led to a very severe and totally avoidable stomach ache. Not that I’m daft or something to not know, I just assumed it wouldn’t matter too much. Turns out, I was wrong. Very wrong. Some 2 antacids and an endless walk around the house, made me realize that, there’s only so much I can eat at once, and that I should be more careful next time. But I know, next time, I’ll still eat too much, and end up in this same situation.